The AG 30 charging generator is a high-voltage unit that is used together with HAUG charging electrodes and a suitable counter-electrode. The charging electrode must be mounted at 10 to 30 mm above the material to be charged, exactly opposite the counter-electrode. When an earthed counter-electrode is used, it must be in contact with the material to be charged. In order to obtain a constant and reliable charging, we strongly recommend that the materials, which are to be pinned together, be neutralized by means of an appropriate HAUG ionizing system before the charging process. HAUG charging systems are designed to apply electrostatic charges without physical contact. These systems can be used for any application where different materials are to be pinned together electrostatically. At least, one of these materials must be non-conductive. The electrostatic pinning serves to enhance subsequent processes, such as film/foil overlapping in packaging machines. The AG 30 charging generator generates an adjustable high voltage of 40 kVDC. The device is available with either positive or negative polarity. Integrated measuring instruments show the voltage and the actual flowing current. High voltage and current threshold can be set with two different potentiometers. In the event that the flowing current exceeds the pre-set limit, an error signal is receivend and the high voltage is switched off. The AG 30 charging generator can be set up for intermittent service by means of an external control. An external signalling unit can be activated through the integrated signal connection. the pinning of film/foil in reversing winding systems, the pinning of film/foil reels in order to prevent the telescope effect, and the pinning of film/foil onto the cardboard tube, without any adhesive, at the start of film winding. At Haug North America, we are committed to providing each and every customer with unsurpassed application planning and assistance, high-quality state-of-the-art products that meet or exceed industry standards, and the highest level of technical support and service. Since its founding in 1957, Haug has established an enviable reputation for excellence. Our extensive product line and worldwide distribution network assures our customers of fast and convenient availability of exactly the right products for each and every application. The product design team at Haug is devoted exclusively to the development of state-of-the-art static measurement, control and generation products and systems for use in industrial processes. Without the distraction of non-static related products, our design and development engineers remain focused on providing the ultimate in static control. Haug products and systems undergo the most rigorous quality control testing, ensuring long trouble-free operation and a safe and operator friendly work environment. This commitment to quality is of particular importance in safety features such as shielded coaxial cable and Haug's patented X-2000 connection system. Haug North America. provides an indepth information on static control and sttic elimination products. 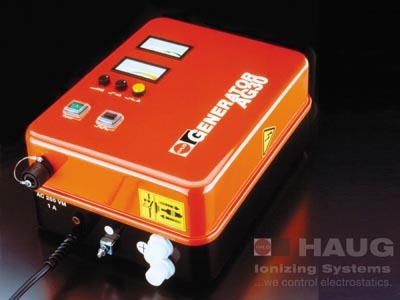 The HAUG Static Eliminator Bar (Ionizing Bar) are a powerful and strong piece of equipment. The HAUG RI-LG Ionizing Air Gun has its name with good reason: this ionizing device, with its service friendly handling, is a peerless innovation in the field of elimination of dust and charges.HAUG Charging Generators are high-voltage generators that work in conjunction with HAUG charging electrodes to apply electrostatic charges without physical contact, for example, for fixing, positioning and electrostatic "adhesion". Much more information on our product line is available on this web site.